Dancer should be comfortable with musicality and movement concepts. No tempo frightens you. Creativity and expression on the floor is what you are looking for in your dances. Dancer has travelled and learned from a variety of teachers in a variety of places. 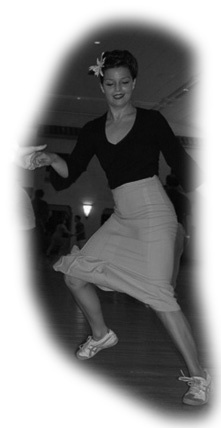 Charleston, Balboa, Shag, Blues all have an interest to you and you work them into your dances as the music moves you. You understand that the fundamentals are key to this dance -- maybe even having revamped your swingout several times already. Lindy Hopper. Belly dancer. Hair-removal Laser Technician. The mysterious figure that is known only as "Nina" (and sometimes "Naomi") has many titles from prestigious dance competitions. But that's only a small part of her accomplishments. For instance, she can swivel in midair. She can simultaneously create vintage-style dresses and then destroy them while dancing. She can make 12-minute biscuits in 10 minutes. She writes upbeat musical theatre involving funeral homes. And last, but not least, she is a part of the award-winning Lindy Hop team the Silver Shadows, which sounds like it's a group of super heroes. And that's what she is. A Super Hero--one whose main super power is doing swivels in midair. And one day, they might save the world. Until then, she lives in Washington D.C. and falls down a lot. Opening dance for Nina's Weekend. Yup, Nina is sweet and hot. Sometimes both at the same time. Nina starts the weekend with a look at how she apporaches the swing out. Ladies come and add more sweet and hot to your swing out. Guys come and add some refinement to your lead so you can handle these follows. Leads watch out by the end of this class you'll be in danger from the follows new super power, killer swivels. Follows take your swivel to a new level. Leads come and learn new ways to show off your follow and maybe a few moves where the guy can get some swivel action in himself. Leads don't you want to know. Follows don't you want to demand the same. ...Its the way that you do it. And Nina is here to help you with a styling class. The Big Band sounds of the Red Rock Swing Band will be heard at Tapestry this Saturday, playing for TCSwing's 1st Saturday Swing Dance. This event will cost 8/10$ and is hosted by TCSwing. If you like Pie and if you like Cake, You'll enjoy Nina's solo jazz class to get you... ya know, movin' and groovin' on the good foot. We weren't sure if we should call it wicked charleston, killer charleston, or kung-fu charleston. But one thing we are sure of is it will be dynamic, fun and charleston. Oh, and some lady named Nina will be there. Just like it sounds: Moves that Nina really likes. And if she likes them they must be awesome. So if you learn them then you'll be . . . awesome. Finishing off the weekend with Dinner and Dancing to Robert Bell's Twin Cities' Hot Club. THIS EVENT HAS AN ADDITIONAL COST. The Times Bar and Cafe is a bar located at 2nd and Hennepin in Minneapolis, just across the river and kitty-korner to Nye's Polynesian. There is a occasionally enforced 2 drink minimum and at some point in the evening it does become 21+.